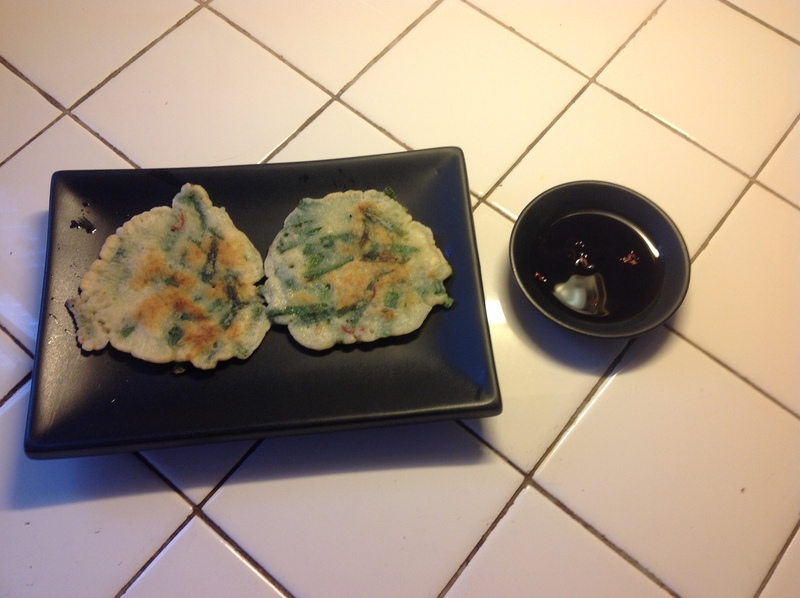 Today, we had our first Ooooby meal for the season – Korean Garlic Chive Pancakes. Even before rhubarb, even before asparagus, garlic chives appear in my garden. Garlic chives, aka: Chinese chives, Oriental garlic, and Chinese leek. In case you are unfamiliar with garlic chives, you might like to know that they are a plant that is much like regular onion chives. But, as the name suggests, garlic chives’ flavor is rather garlicky, yet less so than regular fresh garlic. Garlic chives can be used in much the same way as onion chives, as a seasoning or as a garnish. Yet, because garlic chives are larger and more robust plants, they may be used as a vegetable, too. 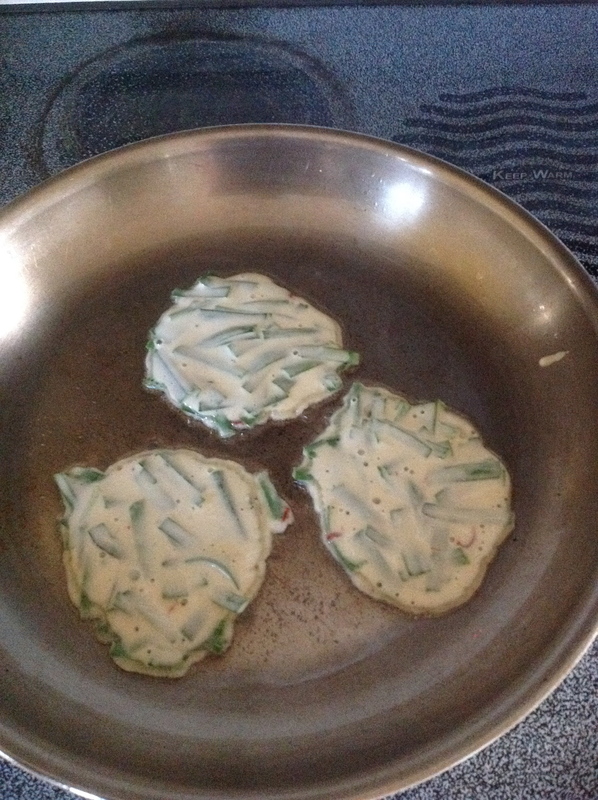 Garlic chives pancakes is a simple and inexpensive meal. 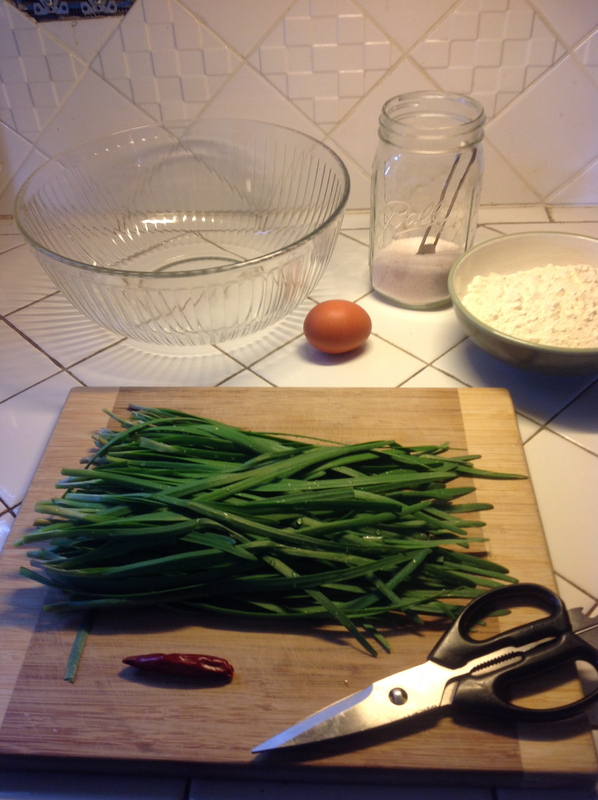 There are many variations, but the basics are: an egg, a little salt, a bit of hot pepper, some flour and water to make a thin batter, and a big handful of garlic chives, of course. 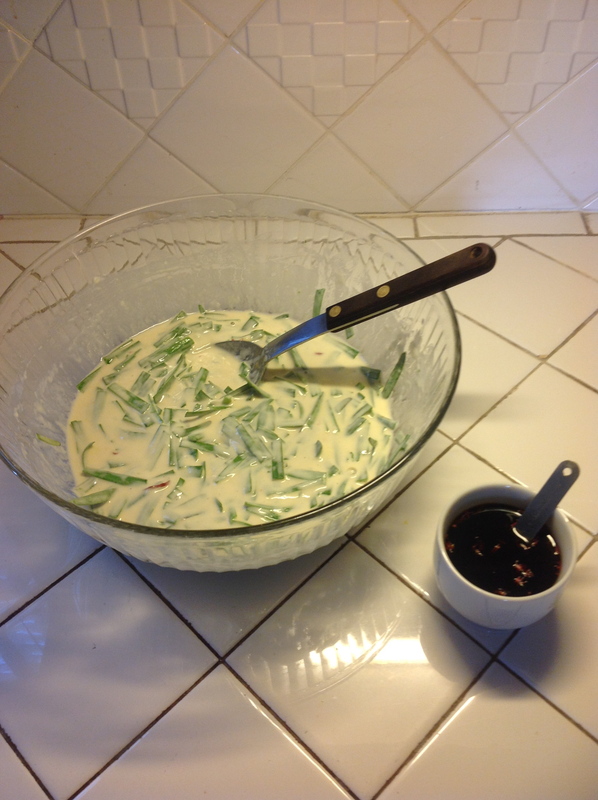 Fry the batter in a little oil and serve with dipping sauce. My boys love this meal. Stir in: 1/4 teaspoon salt, 1 1/2 cups flour (all purpose wheat flour or rice flour will do). Add: 1 1/2 cups cold water and mix to a thin batter consistency. Stir in: cut garlic chives and cut green and/or red chili and/or julienne carrot for color, if you wish. Fry: in a little hot oil until batter is cooked through. Mix together: 2 tablespoons each soy sauce, vinegar (rice wine vinegar is nice), and water. Stir in a minced fresh garlic clove and some minced chili pepper. Garlic chives, allium tuberosum, is a hardy perennial. That means that once they are planted, they do not need replanting, because they come back on their own each spring. They grow in much the same way as regular onion chives, except that the leaves are flat instead of tubular. Garlic chives will grow in USDA hardiness zones 3-9. They grow to about 1 to 1 1/2 feet high, and have a fragrant, creamy white flower that attracts pollinators to the garden. If you wish to grow your own garlic chives, start them by seed or propagate them by bulb. They enjoy well-drained soil and either full sun or partial shade. They can spread aggressively if allowed to go to seed, so to control spreading, deadhead the flowers after blooming. There is fantastic new new business model developing – the profit-for-charity. I’ll share information about a few such organizations. I just learned about a company named Albany Bagel. This company has the stated purpose to bring real bagels to the city of Albany, NY and to build community at the same time. All of the restaurant’s profits will be donated to charities within the city of Albany, NY. They will be selling bagels at the Crossings Farmers’ Market in Colonie every Saturday this summer. The Mennonite Girls can Cook cookbooks is another profit-for-charity business. Mennonite Girls can Cook describes itself as a group of ten women who share recipes and and their faith, with a purpose, inspiring hospitality while using their resources to help needy people around the world. WASH program…a project of Mennonite Central Committee. These two cookbooks are more than just a collection of recipes, they encourage us to ‘think about HOSPITALITY versus entertaining’ so that we may discover a ‘joy in BLESSING versus impressing’. Toms is a business that sells shoes and eyewear that is designed to help change lives with their One for One ® business philosophy. They state that, ‘with every product you purchase, TOMS will help a person in need. One for One.® For each item purchased, Toms either gives away a pair of shoes to a person in need or helps to restore eyesight to a person in need. What a wonderful idea! These business models show us new ways of thinking about how we understand and interact with one another. These business models are designed with the wellbeing of people in mind, as opposed to a sole purpose of profit in mind. If you are aware of any other profit-for-charity businesses, please drop me a note and include a web address if you have one. Laundry Soap is one of those expensive grocery items that we really can make ourselves, and make it much, much, much cheaper too. 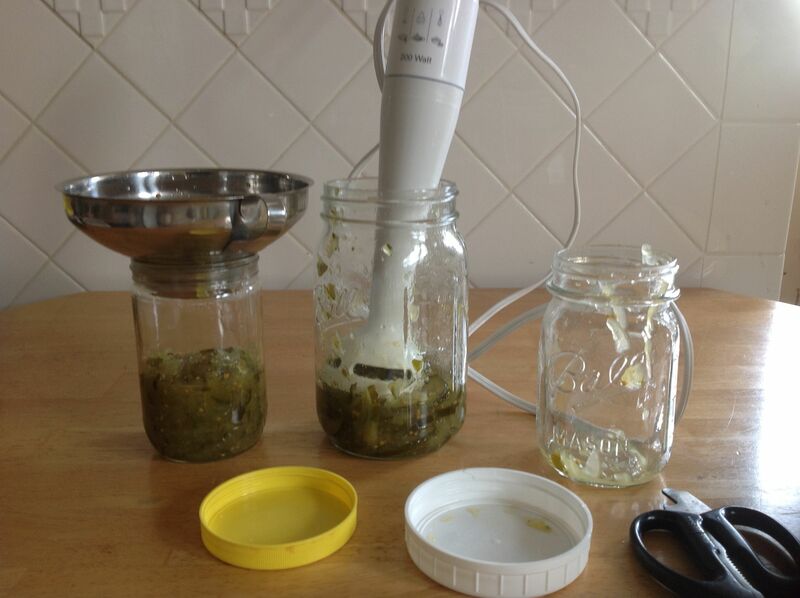 You can make a liquid gel or a powder. 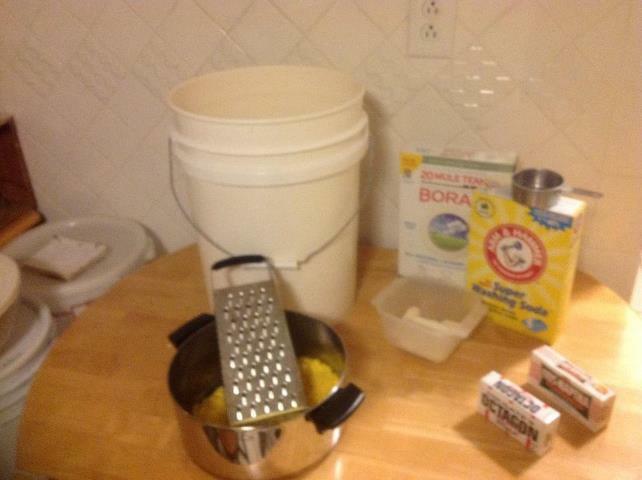 A five gallon pail of laundry gel costs only about $2.00. That’s only 1 or 2 cents a load ! Grate a bar of soap, add water and heat until it is dissolved. Do not let it boil. Pour into a five gallon pail and stir in Borax and Washing Soda until they are dissolved. Fill pail with water and stir again. When cool, it will gel. Use between 1/2 – 1 cup in your laundry – depending on how soiled the clothes are. If you prefer a dry laundry soap, grate the soap finely, add the washing soda and borax and use like any other dry laundry soap. Use the bar soap of your choice. Common choices are Fels Naptha and Octagon as pictured above. Zote is another choice for laundry too. I sometimes use the little left over bits of bath bars instead of discarding them. It’s easy to adjust the amount of Borax and Washing Soda to suit your own personal needs. Fels Naptha, Borax and Washing Soda can be found in many supermarket laundry aisles. Note that this is Washing Soda, not baking soda. You can make your own washing soda too. It is very inexpensive to make from a bulk supply of baking soda. Baking soda in bulk can be purchased at feed stores. Bake your baking soda @ 400° for 30 minutes to turn it into washing soda. Happy savings and simple living. 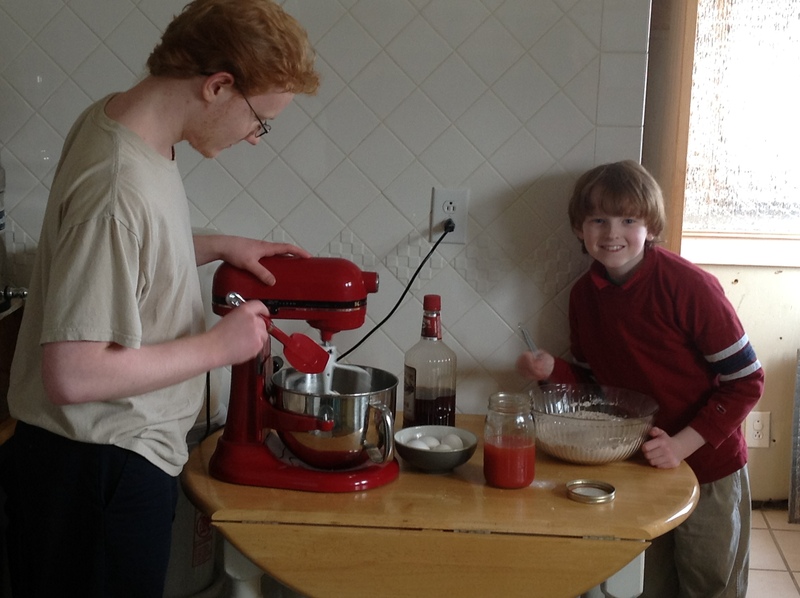 Making Vinegar is one of those really easy things to do. You can use almost any fruit. I use apples, or rather apple peels, and cores. 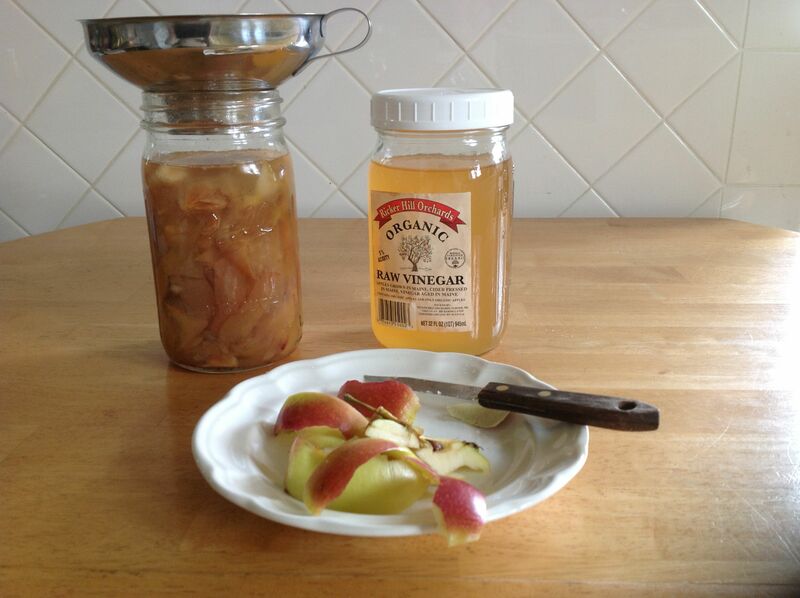 So, making vinegar always begins with an apple dish, and I save the peels and cores for the vinegar. 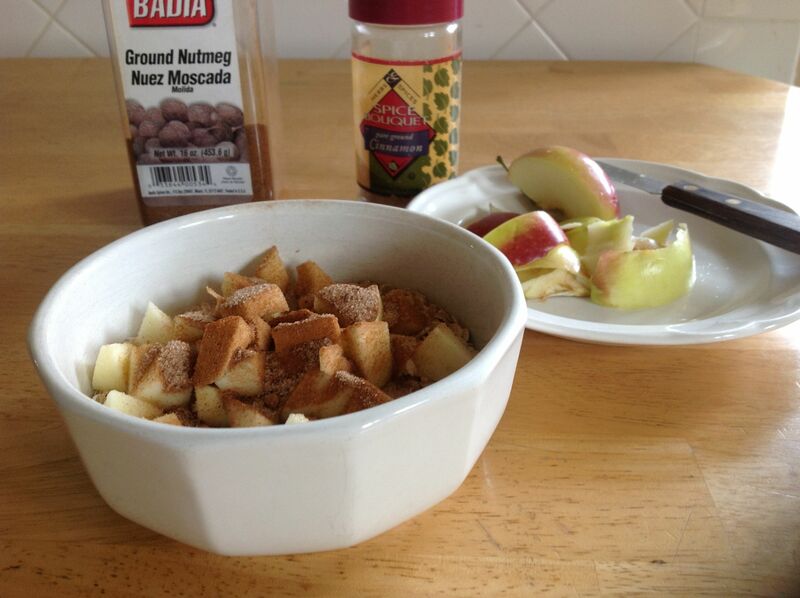 I use regular oatmeal and chopped apple, sprinkle with cinnamon sugar & nutmeg, add water and microwave for a few minutes. No silly little expensive packages with a few dried bits of apple. This is the real thing. It’s filling and yummy, too. Save those peels and cores and place them in a jar and cover with water. Add a little raw apple cider vinegar as a starter culture, cover with a cloth and band and set in a dark place to ferment. Continue adding cores and peels as you accumulate them. Your vinegar is done when it is the strength you like. Strain and compost the solids. 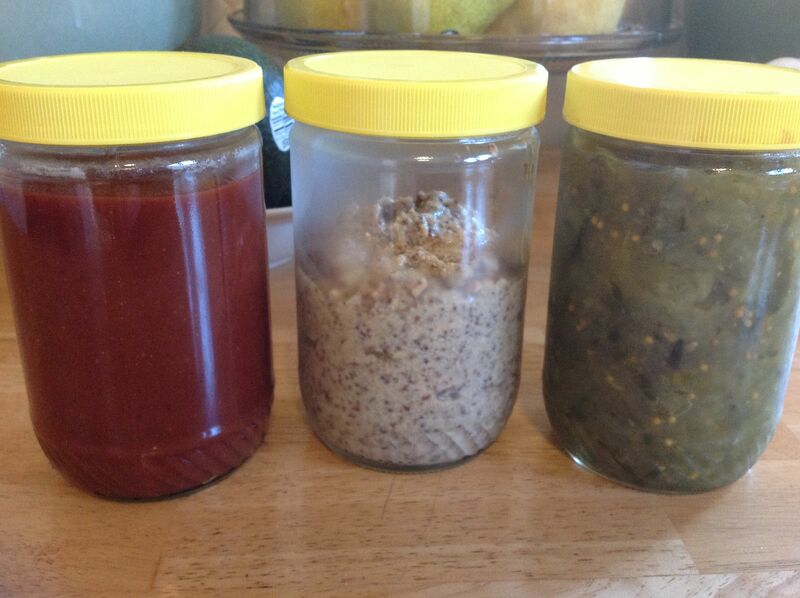 Making my own condiments – catsup, mustard, relish. Simmer for a few minutes then allow to cool. 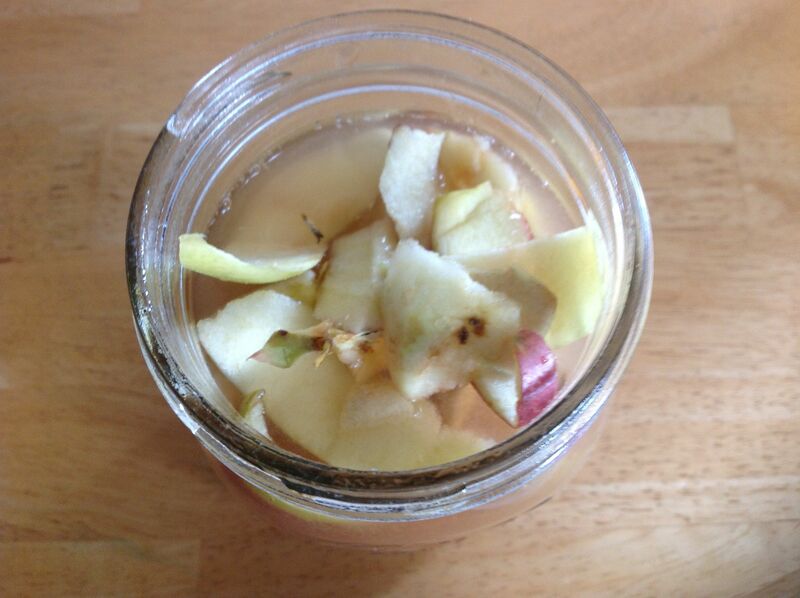 Adding Raw Apple Cider Vinegar once all is cool, makes this a living probiotic food. Mix all until consistency you desire. If a thinner mustard is desired, add more water. 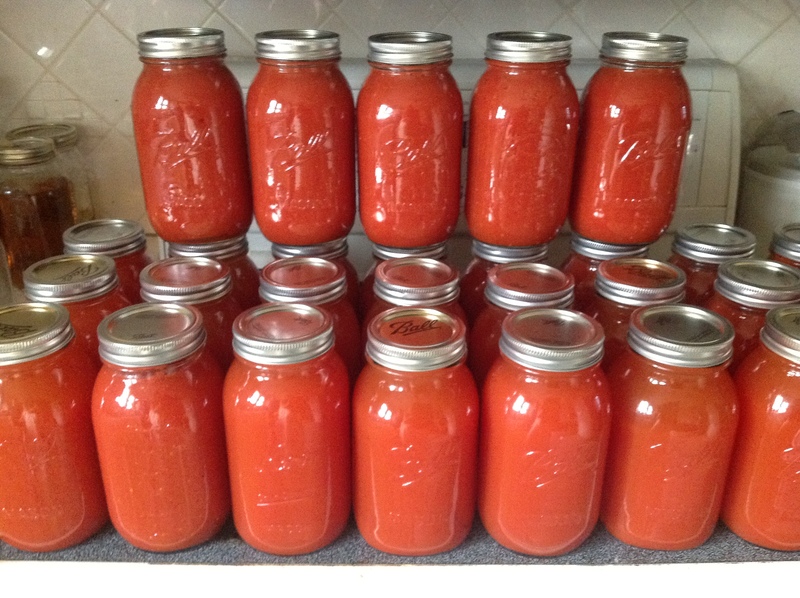 Place in a nonreactive container and age for a few days at room temperature – until it’s bitterness goes away. If a hot mustard is desired, refrigerate it once the bitterness is gone. If you prefer a more mild mustard, age it longer so that the heat will dissipate, then refrigerate. 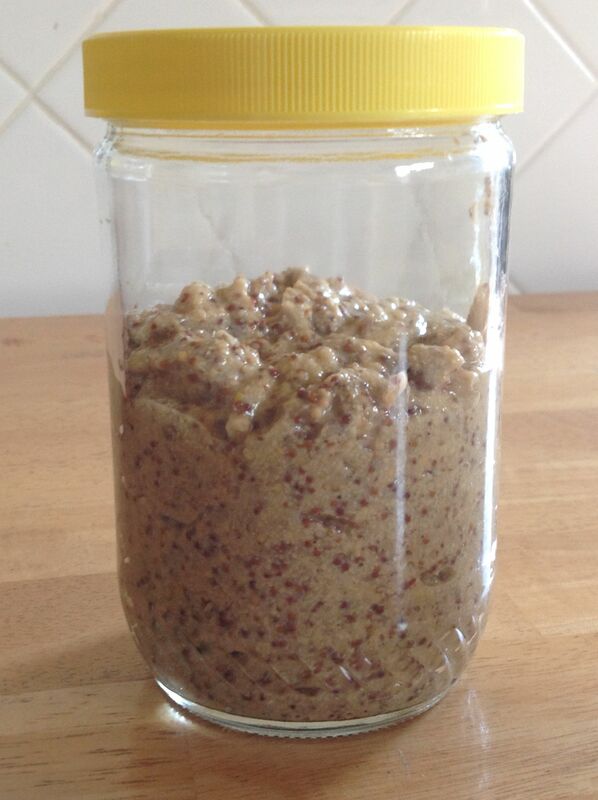 Experiment with your mustard seed, you can use yellow, brown, or black mustard seed & in any combination. You can choose any vinegar or sweetener of your choice too. 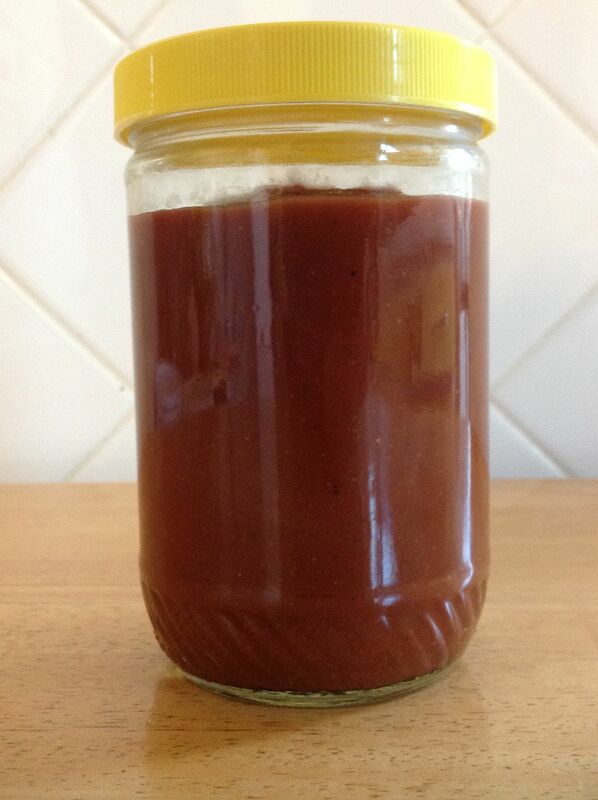 This too, is a probiotic food if you choose to use a raw vinegar. 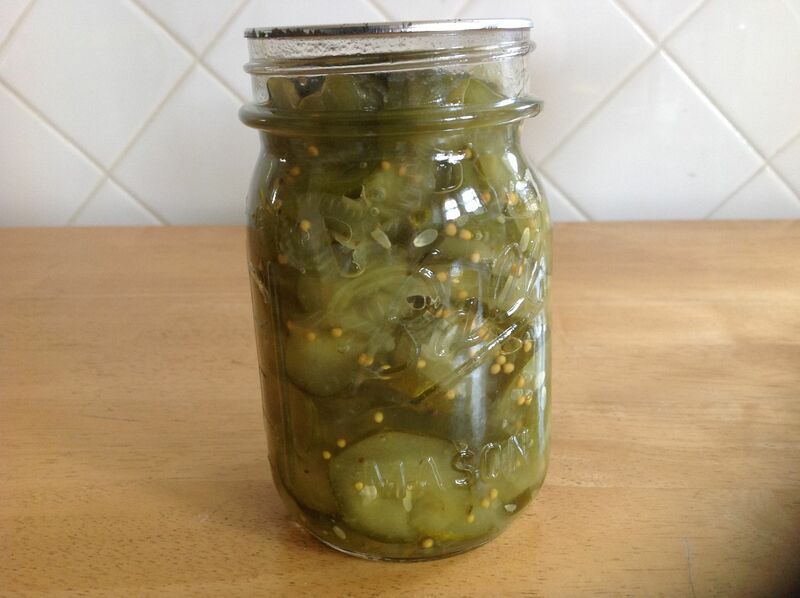 My homemade Bread-and-Butter Pickles become . . . 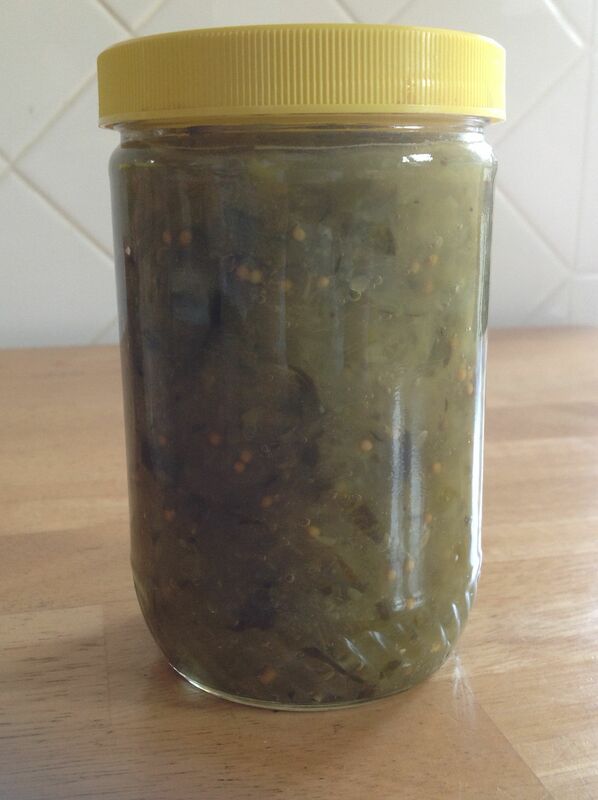 The best Sweet Pickle Relish I’ve ever tasted . . .
With just a quick zap of the blender stick! 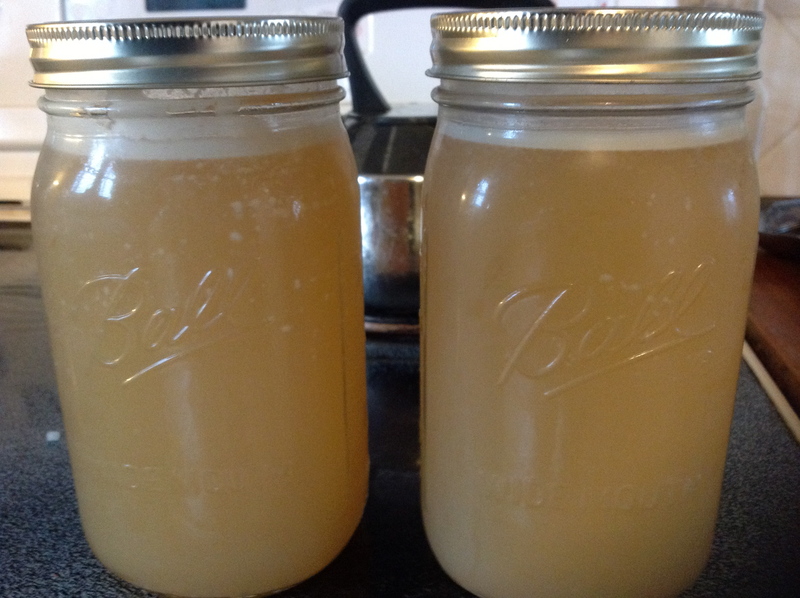 Do you know what bone broth is and why you should make and eat it? Bone broth is how soup was made before we invented processed food. Bone broth is made by simmering the bones, and the skin, and other parts of the carcass of an animal that you otherwise would not eat, such as what is left after the Thanksgiving turkey is no longer. Broth contains minerals that we need, and in a form that our bodies can easily absorb. From broth we can get calcium, magnesium, phosphorus, silicon, sulphur, and trace minerals. It contains glucosamine from the cartilage and tendons. These are all things we pay a lot of money for at the drug store. Making bone broth is very easy to do. After you have cooked your turkey or chicken, remove the meat off the bones and put all of the bones, skin, and everything you do not want to eat into a crockpot. Cover it all with cold water and add a few tablespoons of apple cider vinegar. Turn your cooker on to low and allow to cook for about 24 hours, then strain. If you wish to make Chicken Stock, it is made in the same way, but add onion, carrots and celery to cook with the bones. Strain all when done. I skim the fat off the top and use that for cooking too. It is fantastic to cook fried eggs in, as they will not stick. When I still had a dog, I fed what remains after straining to him. The bones became very soft and crumbly, as much of the calcium gets pulled out and is dissolved in the broth. This is the purpose for the vinegar. Now that Barkley is no longer with us, I put what is left after straining into my compost, as it’s good for my garden microbes too. 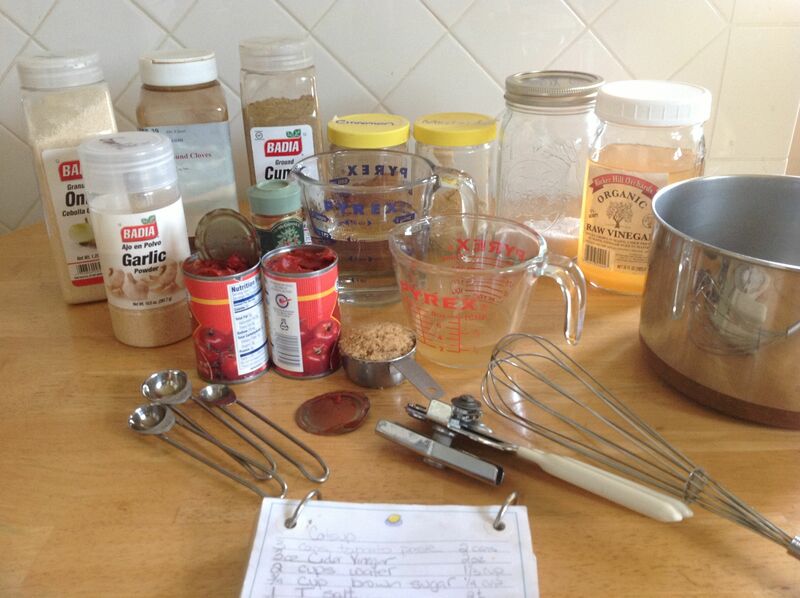 What can you do with your broth? Make soup or gravy, or cook rice in it. Place it in small containers and put it in your freezer. Use this broth, in place one of those little cubes or cans of broth, in your recipes. 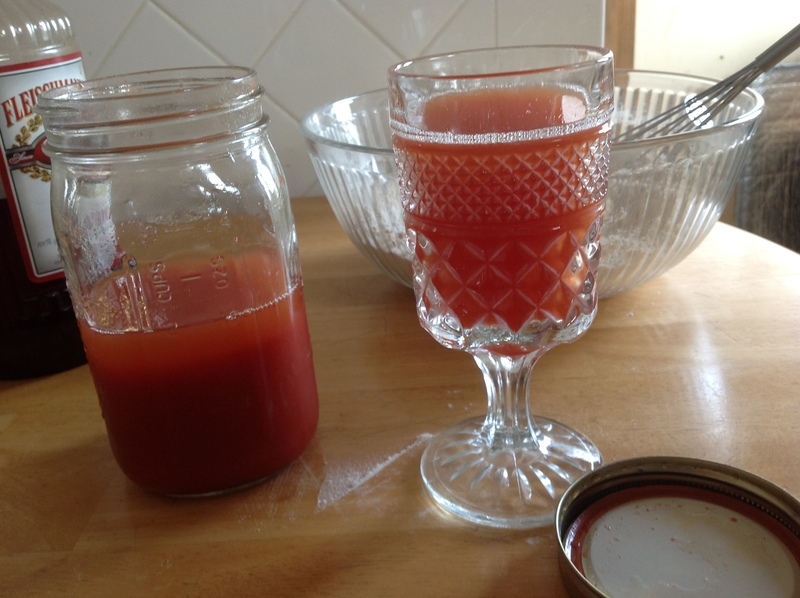 You may notice when your broth gets cold that it has gelled, not unlike Jello. This is very, very good. It means that your broth is not only full of wonderful and good for you minerals, it is also full of protein. “Where did I learn about making bone broth?”, you may ask. I learned it from The Weston Price Foundation. There you may find lots of information about healthful eating and many lessons about the benefits of bone broth and good-for-you fats, amongst other things. I keep my food bills lower while providing my family more nutritious and tasty meals. I am able to make inexpensive, tasty, and nutritious soups and gravy. I replace some of my cooking fat, that I would otherwise need to buy, with healthful chicken fat. I have a free source of ‘bone meal fertilizer’ for my organic garden (which further acts to reduce my family’s food costs). I help the environment (creation care) by making the most from what I have, and therefore reserve resources that would otherwise go into the production and the sale of what I otherwise provide for myself and my family. This is truly living More-with-Less. The Boys Coloring Easter Eggs. There’s no need to go buy those silly wasteful egg coloring kits. You know, the ones with all the packaging, and little plastic and wire things that end up in our landfills. This may seem silly, but so many of the things we purchase have a very limited useful life, and they add up to be mountains of trash. It is easier to understand when we can see what we do. Here is a link to some artwork by Chris Jordan, Running the Numbers – An American Self-Portrait & Running the Numbers II. These are a very interesting projects and are an even more interesting look at ourselves! Do be sure to click on each image in the art show, the information is fascinating ! Allow to sit for about 5 minutes or until desired color is reached. You can achieve any color you wish, and get deeper brighter colors, for less money and less waste. When we do little more-with-less projects like these, it helps us to keep our eyes open and our minds open about the things we can do ourselves. We do not need to drive to the store and purchase ready-made kits in order to enjoy a holiday celebration. We can celebrate with the abundance that we already own, once we can see in this way. 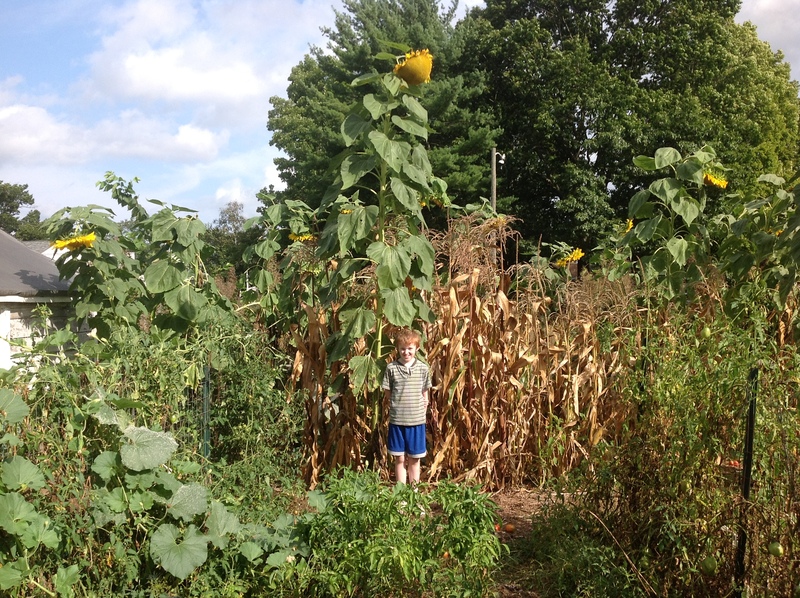 I enjoy learning how to be resourceful and teaching my boys that we can do many things for ourselves instead of relying on objects mass-produced for mass-consumption and mass-disposal. Small projects like these act as a foundation in another way of thinking that is not based on consumption, or ‘keeping up with the Jones’s’, but instead is based on celebrating the abundance of what we already have and the joy of living. It’s also a math geek’s holiday. It’s the official celebration of the mathematical constant pi. 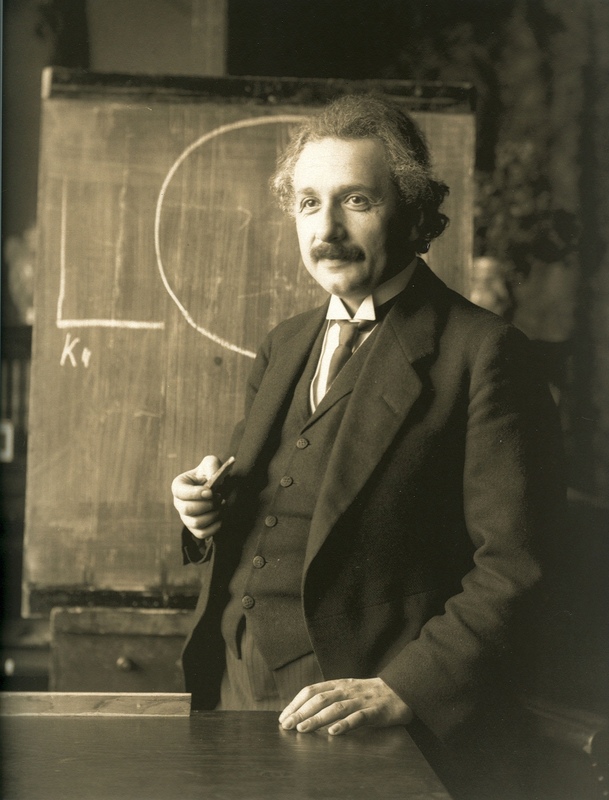 Pi has mystified mathematicians for centuries. It’s a way to describe the shape of a circle. The number represents the ratio of a circle’s circumference to it’s diameter. No matter the size of the circle, the ratio is always . . .
It’s an irrational number that never ends. The numbers of pi are random, with no repeating pattern. “So why are you celebrating with cake?”, you ask. So today, while many folks are celebrating the accomplishments of mathematicians everywhere, I am playing my part by choosing actions that do not contribute to an unjust system where some folks have abundant opportunity in life and where others are prevented from realizing this same opportunity. Lightly grease and flour a 13 x 9 inch pan. 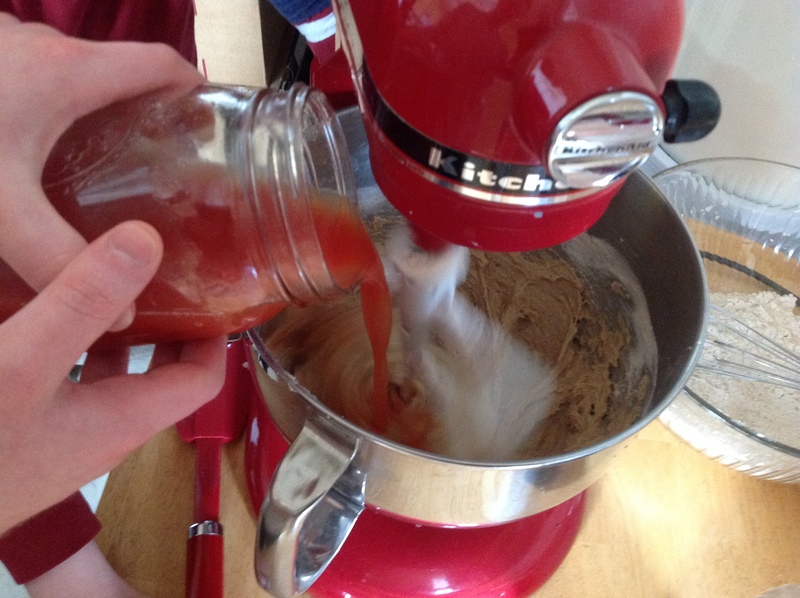 Stir in half of the flour mixture, followed by the tomato juice, followed by the remaining flour mixture. Mix only until no streaks of dry ingredients remain and pour into prepared pan. 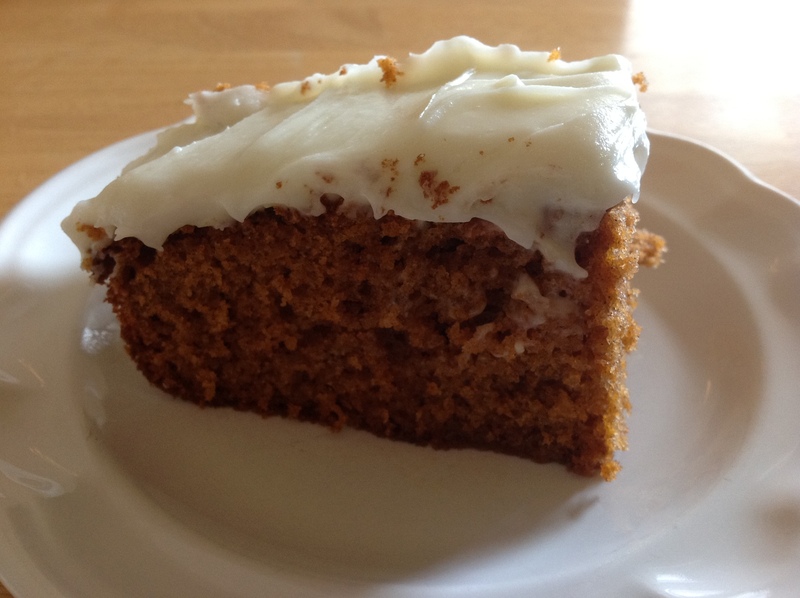 Bake for 45-50 minutes, until a toothpick inserted into the center comes out clean. 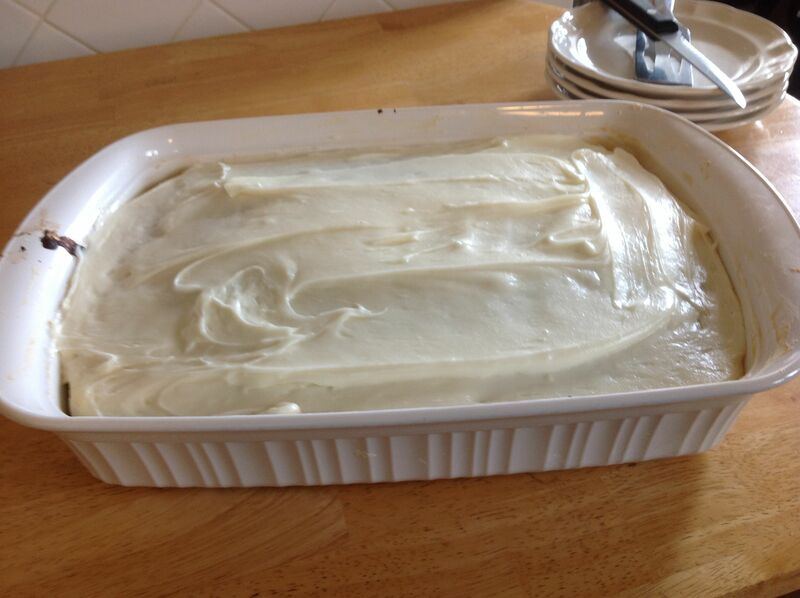 Allow cake to cool in the pan before frosting.